Audi is giving its workers a big bonus. 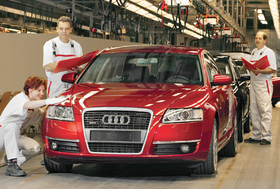 Audi AG is the only German premium automaker that has committed to giving its workers a profit-sharing bonus for 2008. The German automaker will pay 157 million euros in bonuses by the end of this month. That works out to be an average of 3,600 euros per person. Faced with the need to cut labor costs, Daimler AG's management and union decided last month not to pay out a planned 224.2 million euro profit-sharing bonus. The company will decide later this year what to do with the bonus money. BMW will not pay a profit-sharing bonus for 2008. Approximately 43,000 Audi employees in Ingolstadt and Neckarsulm qualify for the bonus that is tied to last year's record operating profit of 2.77 billion euros, up 2.5 percent from 2007. The profits resulted from Audi's 13th consecutive year of record sales. In 2008, the Volkswagen AG subsidiary sold more 1 million cars for the first time in its history.